Throughout your day out you'll experience 14 unique objectives in game zones such as Enemy at the Gates, Zombies' Crypt, Gold Rush and many more. Tanks, sniper towers, haunted graveyards and enemy bases – all venues offer amazing a variety of game zones for players to explore. You'll be provided with full protective equipment including: combat suit, padded body armour, full-head goggles, battle pack, rental of semi-automatic paintball gun. Full training and supervision is provided by dedicated staff. Free tea and coffee available throughout the day. - Minimum age 10 years at centres in England, Wales and Scotland, Minimum 16 years in Northern Ireland and 14 years in Ireland. On arrival at 9am, proceed through our registration area to the military-themed base camp where you will be issued with your equipment including full-length combat suit with padded collar, body armour, battle pack and full head goggles. 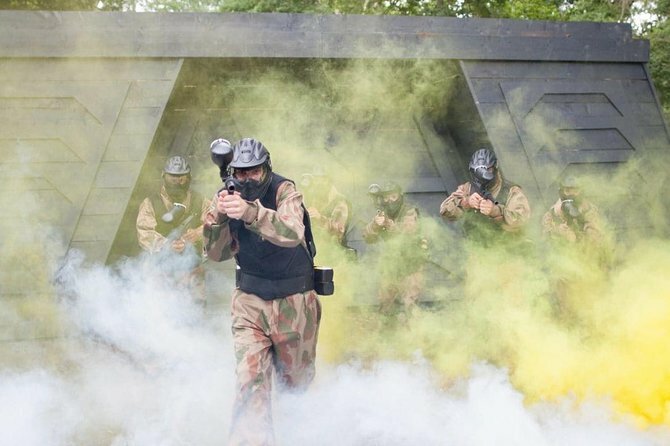 After a short safety demonstration at 10am, teams proceed through the gun zone to collect their semi-automatic paintball guns and fire off some practice shots. You'll experience 6 games in the morning on 3 different fields, with short breaks in between to re-fuel and talk team tactics. After a short lunch break at 1pm, experience 6 more games on 3 different fields. There is a results ceremony to conclude the day, with certificates awarded to those who display heroic behaviour out on the game zones. Find the best content and tours in our apps.Take a look at everything you can do in your destinations. Take a look at these interesting destinations.